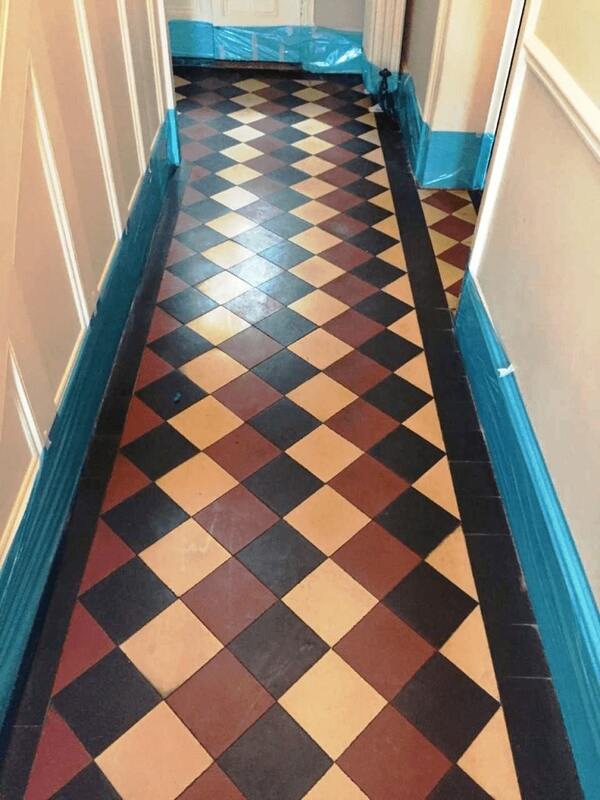 The owner of this Victorian tiled hallway floor at a house in the village of Girton was unhappy with its condition and asked if we could call round and quote for having it deep cleaned and resealed. Girton is just north of Cambridge and only about six miles from our base so it wasn’t long before I was able to call in and survey the floor. 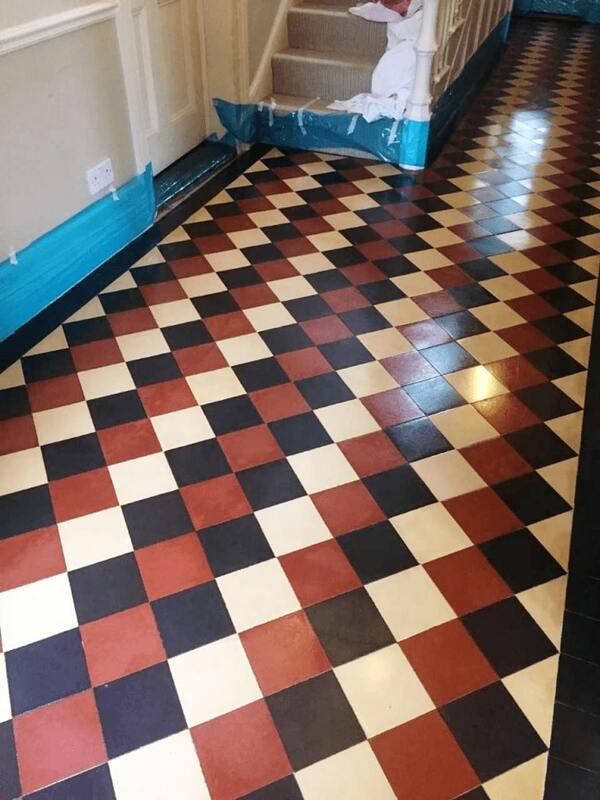 The floor was comprised of a combination of Red, Black and Cream tiles laid in a diamond pattern. 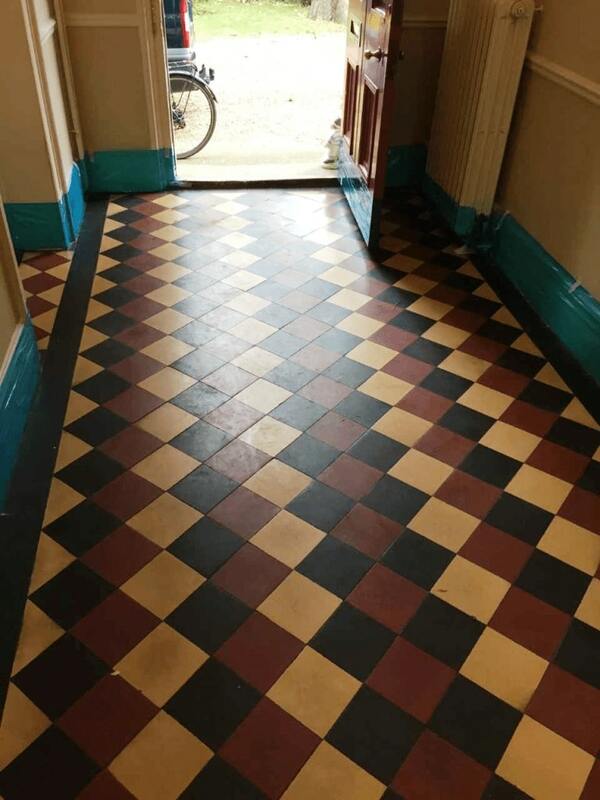 The tiles were in good physical condition and I understand from the owner that it had been last cleaned and sealed about two years prior. Unfortunately, the sealer had now faded and had allowed dirt to become trapped in the pores of the tile giving it a grubby appearance that was difficult to clean effectively. The owner had two large dogs which I suspect contributed to the premature degradation of the sealer. I surveyed the floor, created a quote which was accepted and then agreed a date to return and renovate the floor. On my return I started by taping up the skirting boards and other woodwork with protective tape. Once that was done, I gave the tiles a soak in a medium dilution of Tile Doctor Remove and Go which was allowed to dwell for ten minutes before being scrubbed in using a black scrubbing pad fitted to a rotary floor buffer. Remove and Go is a coatings remover which cleans the tiles and removes any remaining sealer. The soil generated was extracted off the floor using a wet vacuum and the tiles inspected. 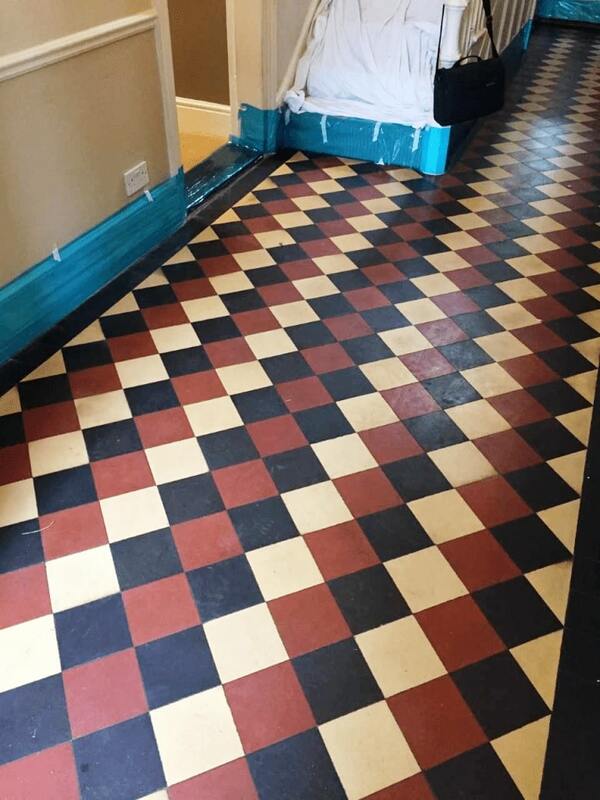 The tiles had responded well to the cleaning process and after spot treating a few areas with a repeat of the previous process it was ready for the next stage which was to give the floor an acid wash. I had noticed there was a slight build-up of efflorescence along one of the walls which isn’t unusual on these old floors where no damp proof membrane has been installed under the floor. It’s caused by moisture rising through the tile and depositing white salt staining on the surface as it evaporates. To resolve this, we neutralise the salts by giving the floor a quick rinse in a dilution of Grout Clean-up. The Grout Clean-Up rinsed off the floor with water and extracted with the wet vacuum which was employed to get the floor as dry as possible before leaving for the evening. The floor was left to dry off fully overnight and I returned the next day, unfortunately after checking the moisture levels I found it needed more drying time, so I agreed to come back the next day. The moisture levels were fine on day three, so I applied multiple coats of Tile Doctor Seal and Go. Seal and Go is a water-based product so you don’t get left with a smell as it dries. 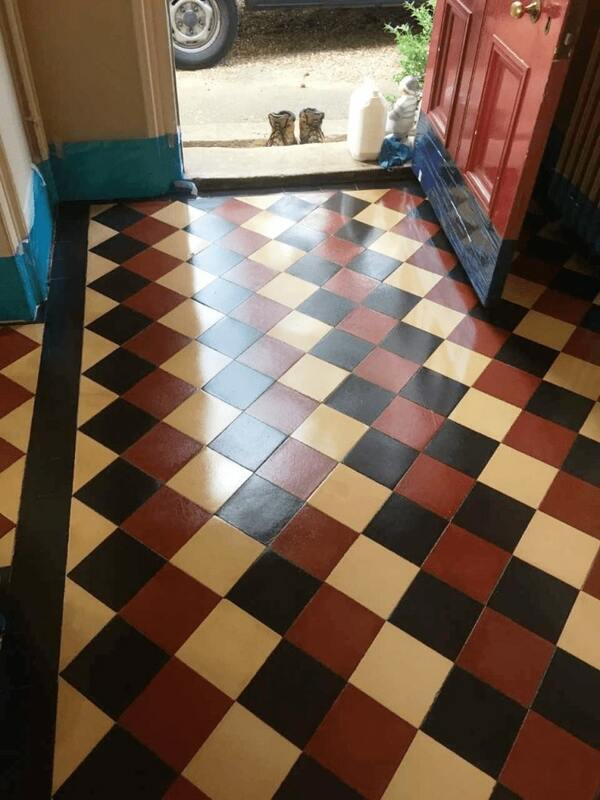 As well as protecting the tiles the sealer also adds a nice subtle sheen that works well on Victorian Tiles and has put new life into the tiled hallway. Seal and Go is a breathable sealer so it will allow moisture to rise up through the tiles however had the efflorescence problem had been worse I would have used a different sealer. On this occasion however the problem appeared to be historical rather than recent. My client was very happy with the transformation and left the following feedback. Tom is personable, knowledgable and professional. I was very happy with my dealings with him from start to finish. He explained everything that he was going to do and gave me some good aftercare advise. My 12 . . . ear old bathroom tiles have been renovated to look as good as new and I have recommended him to a good friend of mine whose travertine floor tiles need attention. Clear assessment of problem and accurate prediction of work needed to clean stone slab. Tom was punctual on both the day he quoted and on the day he arrived to undertake the work. He was also very mindful of our semi house cats and made sure he did not let them out. That sounds simple but of the many tradesmen we have had around in the last six months for restorative work on the house he was one of a couple that did not need constant reminding. The work he undertook was to rectify, as he put it, “some of the worst damage to tiles I have seen to date”! The tiles were limestone and had been badly marked by an acid based cleaner. 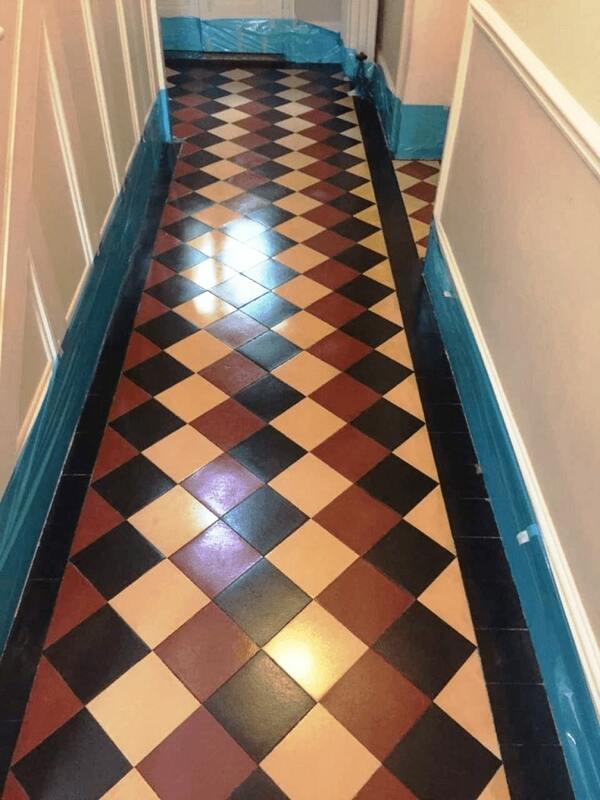 By the end of five solid hours work he had got the tiles back to looking brand new with not a mark to be seen. He did so with no mess, a very cheerful disposition and several cups of coffee! I would not hesitate to recommend Tom to all my own clients and friends. Very happy with Tom, he worked outside normal hours and very easy to deal with. Tom cleaned our old tile floor which proved to be far more difficult than expected. There was a black stain which he could not identify and which was far more resistant to cleaning than the rest of the loor. Tom wouldn’t give up and tried a range of methods even though he had to finally admit defeat. The rest of the floor is excellent and the black mark considerably smaller and less apparent than originally. On top of his amazing efforts he gave us a discount as he couldn’t get the floor as clean as he had wished. Tom did a superb job of cleaning my tiles to look like new. Very professional , methodical and proud of his work. Fantastic service, professional and courteous, results of floor were better than could of hoped for, would highly recommend.